¶ 5 Leave a comment on paragraph 5 0 The attack came from the north. Leading the advance was a column of North Korean tanks followed by two regiments of North Korean troops numbering nearly 5,000 soldiers. Opposing this force was a group of around 400 soldiers from the U.S. Army’s 24th Infantry Division, 21st Infantry Regiment, 1st Battalion under the command of Lieutenant Colonel Charles Bradford Smith, a group nicknamed “Task Force Smith.” The group had arrived in Korea only five days earlier, on July 1, 1950. 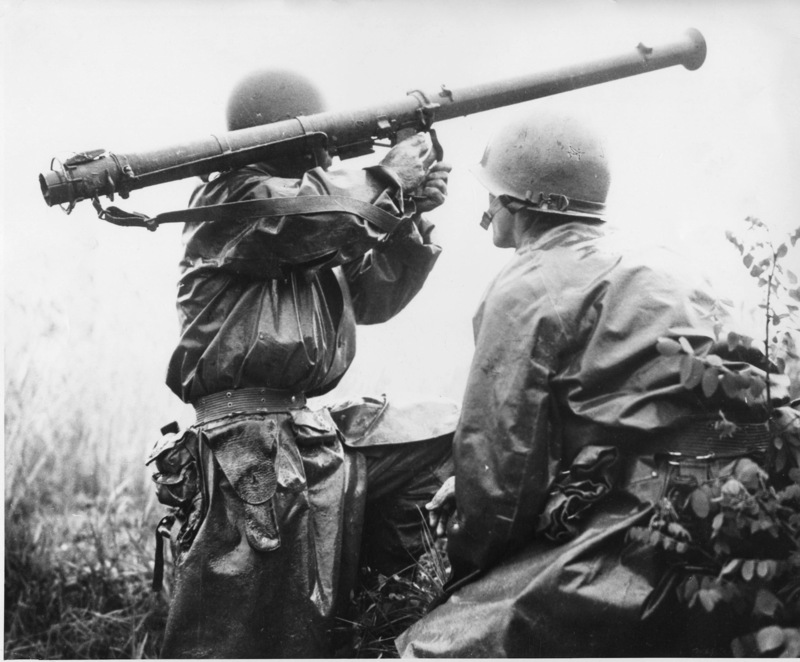 They were among the first U.S. troops to arrive in Korea, having left Japan, where they were stationed, in response to the United Nations Security Council’s decision to send military forces to contest North Korea’s recent invasion of its southern neighbor, the Republic of Korea, on June 25, 1950. Task Force Smith was positioned in the hills north of the town of Osan, with the purpose of halting or delaying the North Korean advance in order to buy time for more U.S. forces to arrive in Korea. ¶ 8 Leave a comment on paragraph 8 0 The stories that Higgins and other correspondents filed identified Kenneth Shadrick as the first reported American killed in action of what would come to be known as the Korean War. ¶ 11 Leave a comment on paragraph 11 0 Figure1. “A team mans a Bazooka at the Battle of Osan. Members of the 24th Infantry Division, first United States ground units to reach the front, go into action against North Korean forces at the village of Sojong-Ni, near Osan. At right is Private First Class Kenneth Shadrick, who was killed by enemy fire a few moments after this photo was made, thus becoming the first United States soldier to die in the Korean campaign.” Photo by Charles Turnbull. Image from Wikimedia Commons. ¶ 12 Leave a comment on paragraph 12 0 So appears Shadrick’s death in the archival record as represented in the Korean War Casualty File (TAGOKOR), 2/13/1950 – 12/31/1953, Records on Korean War Dead and Wounded Army Casualties, 1950 – 1970, Records of the Adjutant General’s Office, 1905 – 1981, Record Group 407, National Archives at College Park, College Park, MD.4 As described in the series scope and content note, the TAGOKOR file “contains information about U.S. Army officers and soldiers who were casualties in the Korean War.” The TAGOKOR file contains 109,975 records, detailing twenty different categories of casualties, including those killed, wounded, hospitalized, missing in action, and captured. Each record has twenty-six discrete units of coded information based on a variety of classification systems. ¶ 13 Leave a comment on paragraph 13 0 Alongside the data itself, and available through the file’s technical documentation and accession dossier (the latter is the administrative documentation chronicling the file’s acquisition and administration by the National Archives and Records Administration [NARA]), is a wealth of information detailing TAGOKOR’s provenance, its circuitous custodial history, the actions taken to ensure its preservation, and the history of the many modes by which it has been made available to researchers and the public. 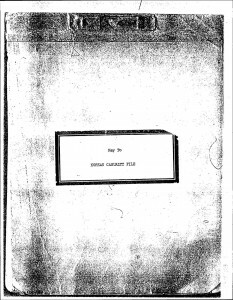 This technical, managerial, and preservation documentation includes information as diverse as long-forgotten and poorly mimeographed military classification codebooks, key-punch instructions, physical transfer requests, preservation job summaries, access request correspondence, hash validation reports, and a maze of correspondence between military administrators, archivists, veterans, and private citizens. The documentation represents an accumulated body of information revealing the material and organizational ministrations and transformations through which this archival record has been acquired, preserved, and made available. ¶ 14 Leave a comment on paragraph 14 0 The story of TAGOKOR, then, is not just the story of the horrific events it sought to record, but also the story of its constitution and reconstitution by its custodians and users. From its origins as a statistical computing file, to its current accessibility both as a full ASCII data download and a searchable database through NARA’s Access to Archival Databases (AAD) portal,5 the history of TAGOKOR illuminates the complexity of managing, preserving, and making available digital archival records and the often circumstantial and regenerative methods through which archival materials are published. TAGOKOR also carries evidence of the evolving matrix of ephemeral classification systems and encoding methods applied to raw data to facilitate its use, transmission, and interpretability, as well as the subtle influences of the media types and protocols by which it has been migrated and reformatted. ¶ 15 Leave a comment on paragraph 15 0 TAGOKOR’s associated documentation and its online reconstruction document how digital historical records pass through frameworks of organizational management, hierarchies of description and control, shifting bureaucratic and regulatory environments, and variegated preservation processes in order to be made available for public use. To publish an archive is to undertake an action at once both forward looking and necessarily circumscribed. Promulgated anew in response to technological and epistemological change, yet bearing the vestiges of prior media, management, and classifications, digital archival records such as TAGOKOR offer a rich point of reflection upon the interplay of historical event, administrative custodianship, media preservation, public accessibility, and continuing reinterpretation. ¶ 18 Leave a comment on paragraph 18 0 Figure 2. “Cpl. 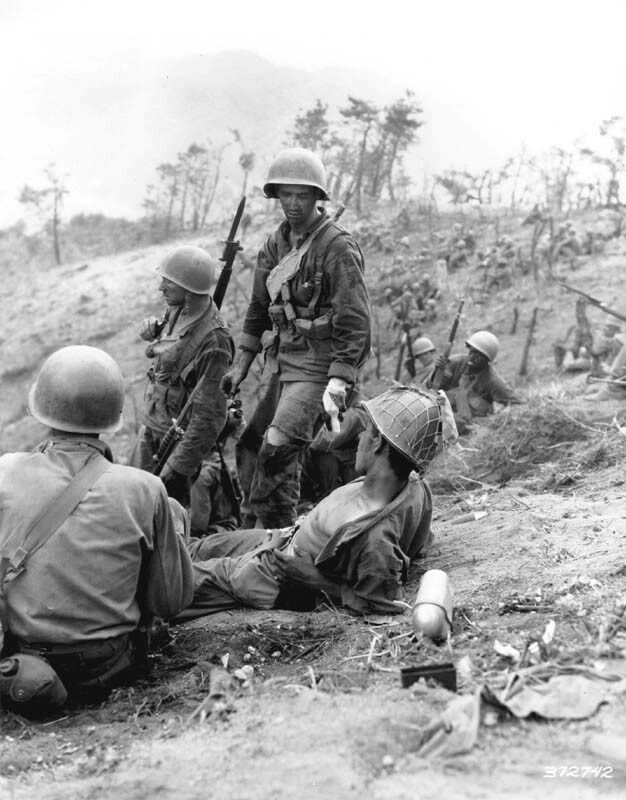 Sam Ayala of Niles, Calif., Co. L, 7th RCT, U.S. 3rd Infantry Division, waits for medical evacuation from Hill 717, Cpl. Ayala was wounded while engaged in a bitter grenade battle with deeply entrenched Chinese Communism. 3 July 1951. Korea. Photo from U.S. Army Signal Corps archive. Photo #8A/FEC-51-23541 (Brigham).” Image from U.S. Army. ¶ 20 Leave a comment on paragraph 20 0 Figure 3. 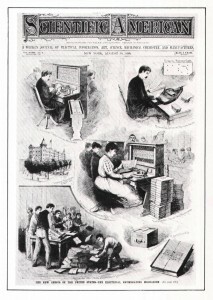 August 30, 1890, cover of Scientific American depicting the Hollerith punch card machine (called the “Electrical Enumerating Mechanism”) processing the U.S. Census. ¶ 22 Leave a comment on paragraph 22 0 Figure 4. 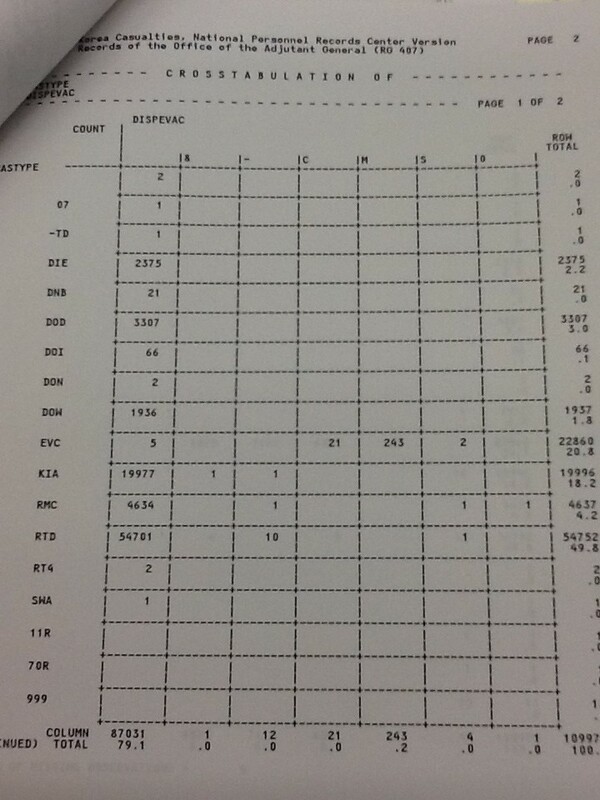 An IBM punch card typical of the type used for TAGOKOR. 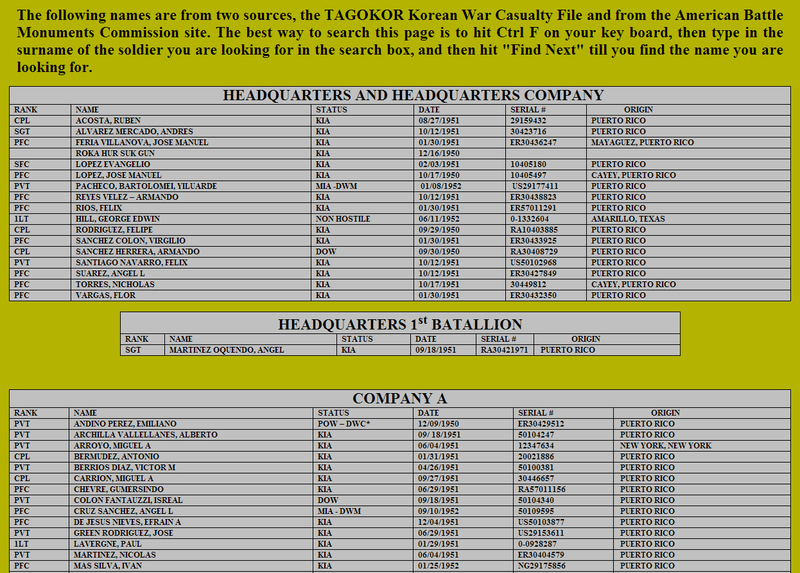 ¶ 23 Leave a comment on paragraph 23 0 The TAGOKOR file no doubt had a similar origin in the MRUs and ended up as a set of 109,975 punch cards recording casualty information for Army soldiers for the entirety of the Korean War (earliest casualty date in TAGOKOR is 1950-06-30 and the final date is 1953-07-28). By the mid-1960s, however, the Army was moving away from punch card machinery. A records survey by the AGO of its Data Preparation Branch, Data Processing Division, USADATCOM in 1964 “included a recommendation that action be taken to convert the punched card file of Korean War casualties to magnetic tape” in order “to dispose of a relatively inactive file of approximately 110,000 punched cards.”12 Curiously, prior to conversion the cards were sequenced by state, then by county within state, then alphabetically by individual name within county. This model was “dictated by past experience indicating that future research activity” would be based on requests by state and county. This first moment of preservation reformatting thus offers an early glimpse of how administrative decision-making, along with expectations of research use, shape the arrangement of, and access to, the historical record. ¶ 24 Leave a comment on paragraph 24 0 Figure 5. 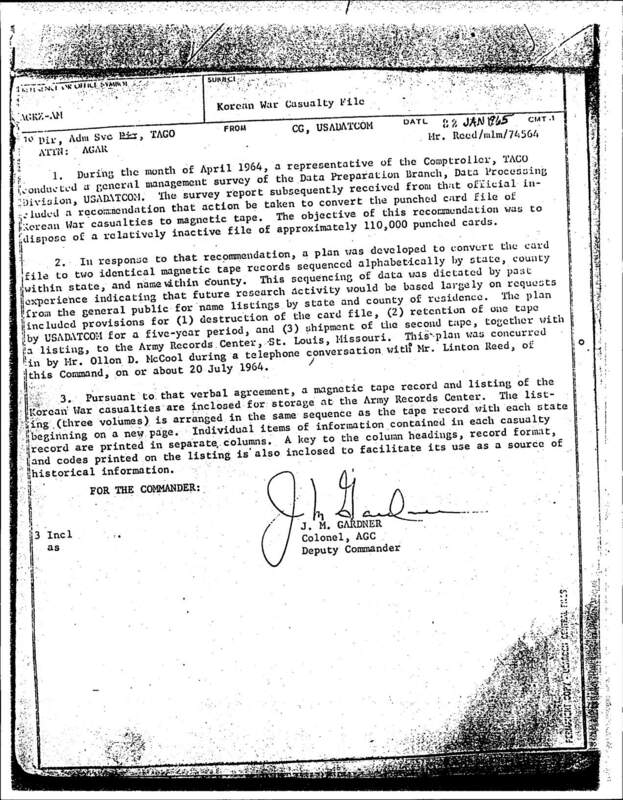 Memorandum from Colonel J. M. Gardner recommending conversion of the TAGOKOR punched card file to magnetic tape. ¶ 35 Leave a comment on paragraph 35 0 From there, the remaining sixty-seven character spaces in each record constitute a dizzying array of classification procedures, dependent upon a multiplicity of Department of The Army Special Regulations (SRs) and other code referents. “Place of Casualty” (character position 35-36) and “Place of Disposition” (character position 52-53) both require SR 330-180-2, “Foreign Station Code” of the “Statistical and Accounting Systems” classifications. Military Occupational Specialty (character position 61-65) requires SR 615-25-2, “Enlisted Personnel Classification Procedures,” and “Type of Casualty” and “Detail Code” (positions 47-49 and 50) require the “Battle Casualty Reporting” codebook SR 330-10-3. ¶ 36 Leave a comment on paragraph 36 0 Figure 8. Record Format in TAGOKOR “Key” documentation listing record item, character positions, and code references for the data. 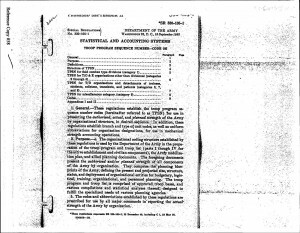 ¶ 37 Leave a comment on paragraph 37 0 “Without documentation for coded fields, individual data records often have little or no meaning,” writes Lee A. Gladwin, an electronic records archivist at NARA. 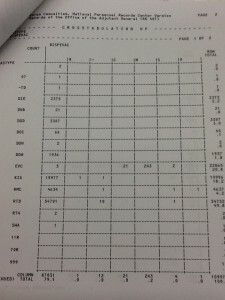 His article, “Recovering and Breaking the U.S. Army and Air Force Order of Battle Codes, 1941-1945,” describes how codes for a World War II punch card set were “partly discovered or broken through the application of quantitative methods and recently discovered code documentation.”15 The riddle of cracking punch card codes has even been featured in journals of forensics analysis.16 As Gladwin notes, many coding systems can “be broken with a great deal of effort and a little luck,” though enigmas remain about the origins and use of many of these classification systems. As the first page of the TAGOKOR’s technical documentation succinctly states, “The documentation is necessary to understand the meaning of the digitized bits of information within the electronic records.”17 Electronic records like TAGOKOR thus exhibit dual dependencies, reliant not just on the interpretability of the machine-readable encodings of hardware and software (themselves often intertwined, interdependent) but also contingent on old mimeographed codebooks, obscure or difficult-to-locate print classification volumes, or often incomplete photocopies of legacy documentation. Servile to the pull of technological change, the whims of human signification, and the longevity of printed errata, early electronic data files and digital archival records like TAGOKOR exist at a distinct intersection of documentation, mechanism, and technological reconstitution that discommode ideas of trustworthiness, decipherability, and explication. ¶ 38 Leave a comment on paragraph 38 0 Figure 9. 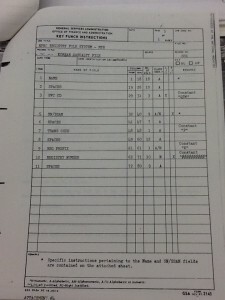 Sample page from the photocopied version of the SR 330-105-1 codebook made partially available in the TAGOKOR technical documentation. ¶ 44 Leave a comment on paragraph 44 0 Figure 10. 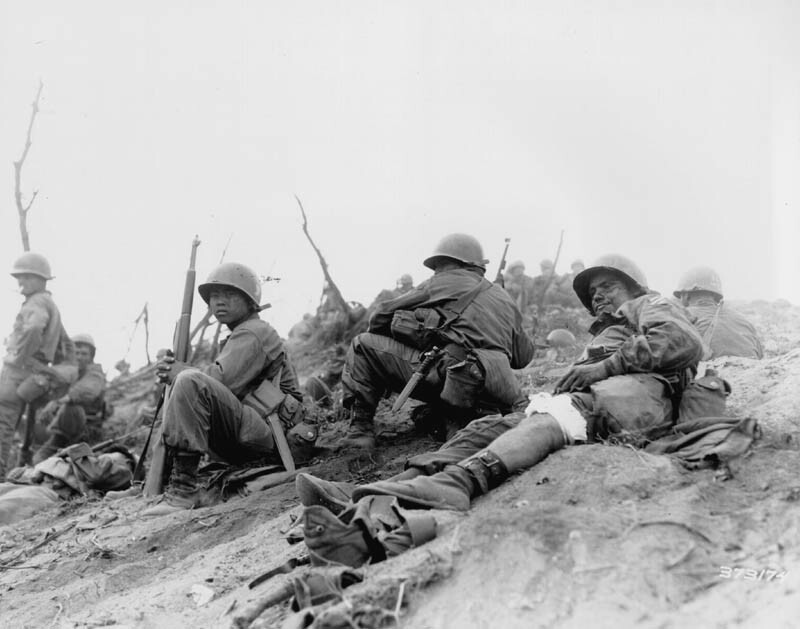 “Hit in the back during a grenade duel, Corporal Dominick F. Zegarelli, (Utica, N.Y.) Company L, 7th Regimental Combat Team, U.S. 3rd Infantry Division, waits for evacuation, while other members of his platoon rest. 3 July 1951. Korea. Photo from U.S. Army Signal Corps archive. Photo #8A/FEC-51-23550 (Brigham).” Photo from U.S. Army. ¶ 48 Leave a comment on paragraph 48 0 Figure 11. NPRC request for new file. ¶ 49 Leave a comment on paragraph 49 0 Prior to NARA’s search for TAGOKOR, the file was delivered to other departments as well, including the Mortuary Affairs and Casualty Support Division of the Department of the Army, which requested a copy in the early 1980s. That request led the NPRC to note at the time that its own paper listing of TAGOKOR records “has suffered damage and is in need of replacement. Also the current format of the listings by state, county within state, and alphabetically based on the surname within the county, is no longer the most desirable format.”23 Changing expectations about research interest and evolving models of accessibility again had TAGOKOR’s custodians reconfiguring the outputs of the data for optimal usability. ¶ 51 Leave a comment on paragraph 51 0 NARA as an agency has had a similarly uncertain bureaucratic history, having been created as an independent federal agency in 1934, then, in 1949, moved under the General Services Administration and renamed the National Archives and Records Service, only to be reestablished as an independent agency under its current name in 1985. 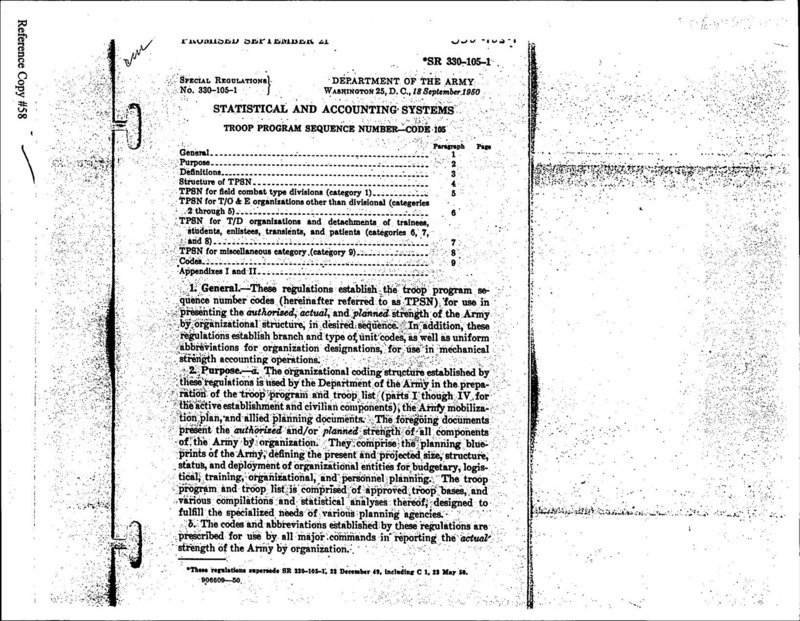 Similar changes happened within the agency itself, with the departmental responsibility for electronic records being established as a branch, upgraded to a division, downgraded back to a branch, upgraded back to a division, and upgraded again to a center—all between 1968 and 1988.26 Staffing levels mirrored many of those changes and also occurred in the context of larger government-wide workforce reductions and expansions; electronic records staff over that time numbered from the single digits to well over fifty. The definitive history of NARA’s early work with electronic records, Thirty Years of Electronic Records, details the near-cyclical saga of the program blossoming, languishing, then rising again in its first three decades—developments often occurring in response to agency directives, presidential politics, and legal challenges involving presidential email and other electronic federal records (lawsuits for which NARA was often tasked with action even if not involved in the lawsuit itself). The pace of technological change had its impact as well, with NARA commissioning many preservation systems over the years, being forced to reassess prior appraisal guidelines due to hardware and software dependencies, making ongoing preservation format decisions as storage grew and new media types emerged, and steadily increasing the types of formats it accepted and the volume of born-digital materials it acquired. ¶ 52 Leave a comment on paragraph 52 0 Figure 12. 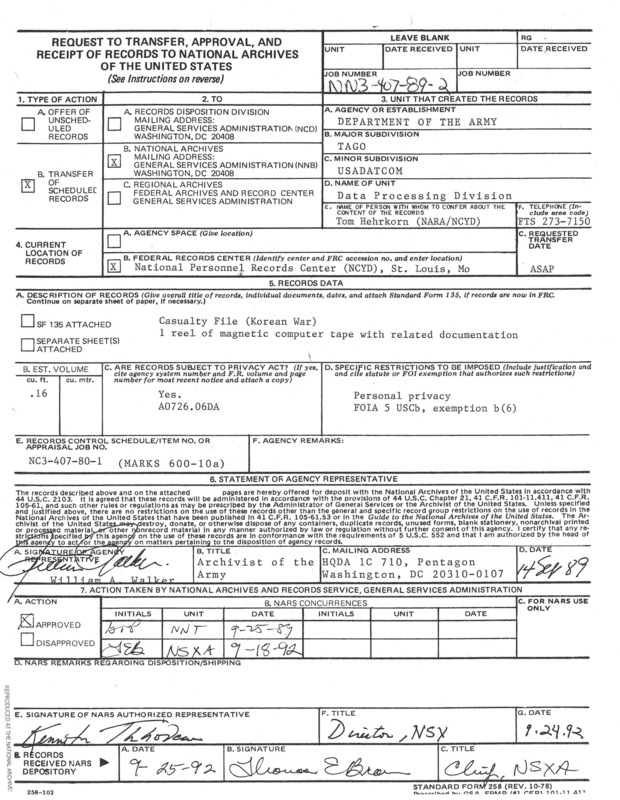 Request to Transfer, Approval, and Receipt of Records to the National Archives of the United States. ¶ 53 Leave a comment on paragraph 53 0 TAGOKOR was transferred to NARA in September 1989 from the Data Processing Division of the Adjutant General’s Office.27 The copy of TAGOKOR had been located at the NPRC, which itself had copied TAGOKOR from its first 7-track tape version, as described above. 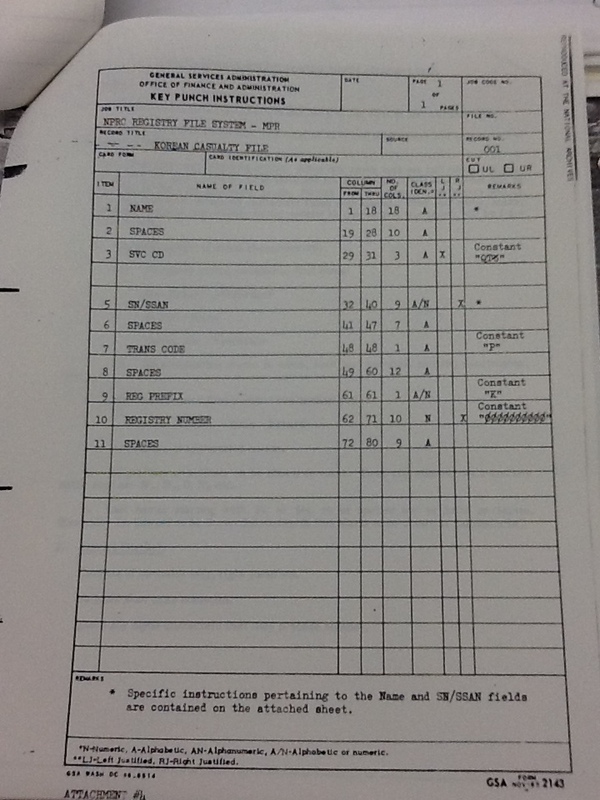 Thus, NARA received an open-reel, 9-track magnetic tape, in Extended Binary Coded Decimal Interchange Code (EBCDIC). Given that TAGOKOR’s first preservation reformatting was in 1964, it makes sense that it used the EBCDIC encoding method, which was developed by IBM and used in its large mainframe computing systems of that era. The encoding system reveals its own punch card origins, with its non-continuous alphabet representation. This, along with its proprietary nature, was merely one of its many quirks that made EBCDIC the bane of programmers. The character encoding method is seldom, if ever, used today, long supplanted by more logical character encodings such as ASCII and Unicode. TAGOKOR’s binary encoding methods thus prove just as ephemeral and historically situated as the SR classification codes upon which its character abstractions are drawn. 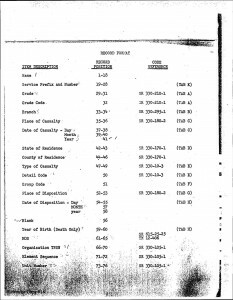 In the “Date of Casualty” field key in the technical documentation, for example, it specifies that the year 1950 can be deciphered by the “12 zone,” meaning the area of the punch card atop the 0-9 digit fields that comprise the card’s body. The “12 zone” could be punched to qualify the below fields. The EBCDIC-to-ASCII encoding has rendered this character as an ampersand. Indeed, occasional migration miscues and garbled translations appear as minor blemishes throughout the dataset and offer a reminder of the file’s passage through multiple methods of binary encoding. ¶ 54 Leave a comment on paragraph 54 0 Figure 13. 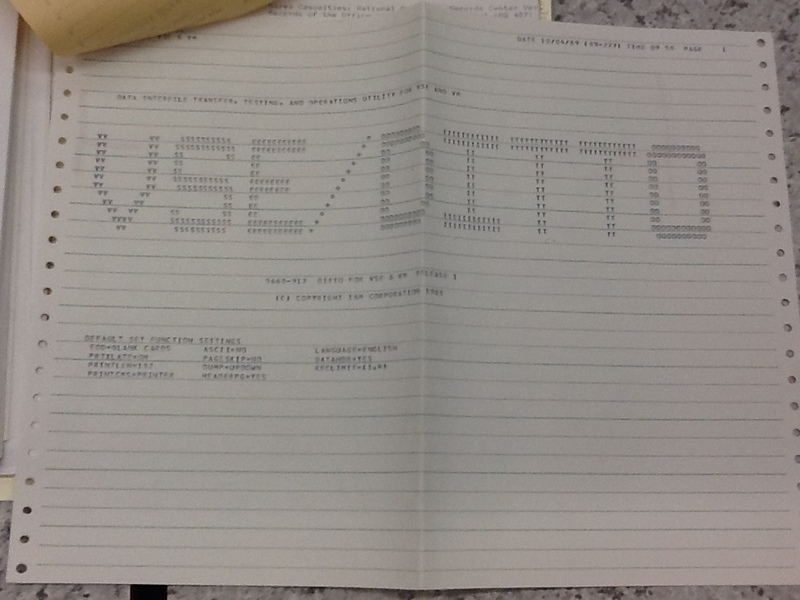 VSE DITTO report cover sheet. ¶ 55 Leave a comment on paragraph 55 0 Other machine influences beyond bitstream patterns and character representation have exerted their influence on TAGOKOR during its time in the archive. Changes in technology also came to bear on the systems responsible for its ongoing custodianship and preservation. 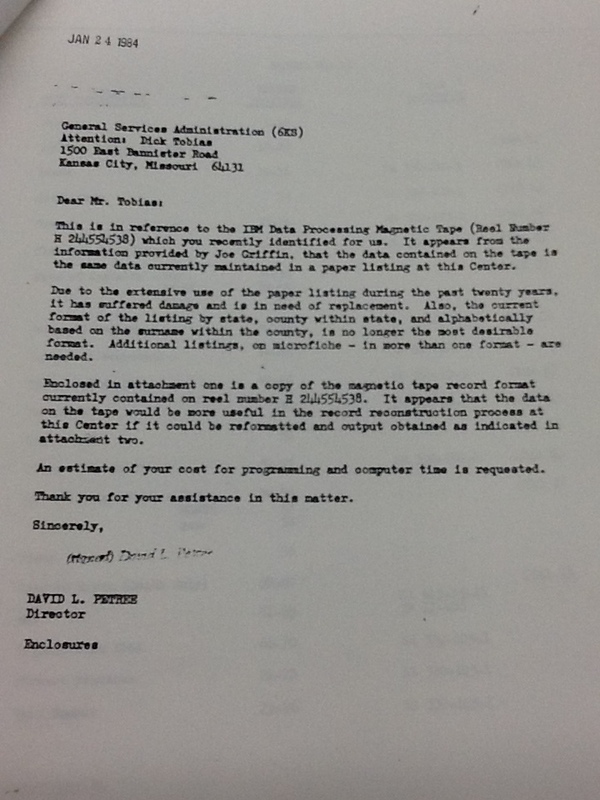 At the time TAGOKOR was formally transferred in September 1989, NARA itself lacked the equipment to access and read the file, having to rent time on mainframe systems at government computing centers. Earlier in the decade, NARA had reached an agreement with the National Institute of Health (NIH) to rent time on their IBM 360 mainframe system for accessing and copying records on 9-track open-reel tapes. TAGOKOR was first analyzed, for archival purposes, with the Data Interfile Transfer, Testing, and Operations Utility (DITTO), to determine the data labels and view some sample records. This preceded a more thorough analysis by the NIH computer center that was able to extract and copy the data labels and records, and provide some information on value frequencies and cross-tabulations. A backup copy was created, along with a duplicate “public use” copy. The file was also copied to an archival master 18-track, 27871 bpi, 3480 magnetic tape cartridge, which NARA had moved to as its preservation format two years prior. ¶ 56 Leave a comment on paragraph 56 0 By 1991, the Archival Electronic Records Inspection and Control (AERIC) system had come online and allowed a more comprehensive verification of the records within the file. This more thorough analysis includes an examination of data elements, distinct values, null fields and records, and code frequency counts. Matched with known codebooks and the SRs required to interpret the data, AERIC offered a level of error identification and data analysis similar to what one would encounter using a spreadsheet or pivot table today. 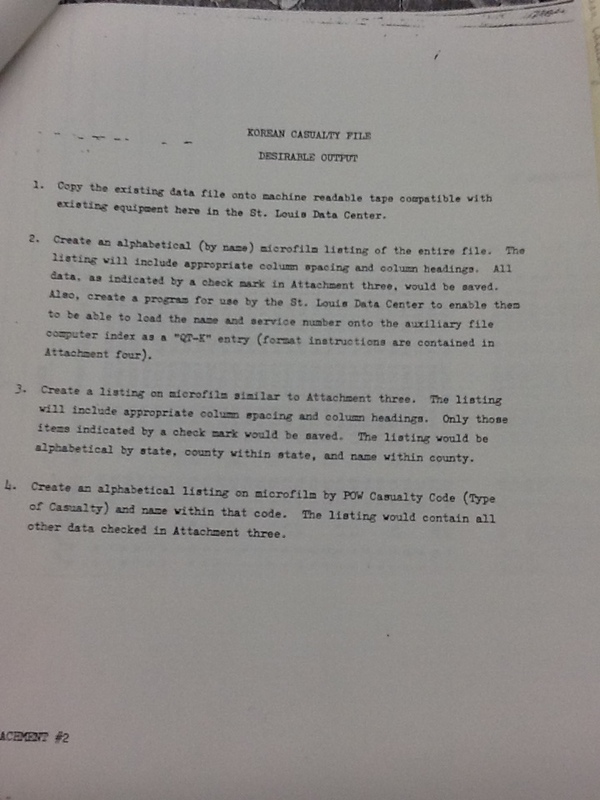 A few years later, in 1993, NARA launched the Archival Preservation System (APS). Driven by the exponential increase in electronic data files being transferred from agencies to NARA (NARA accessioned 150 electronic data files in 1988; four years later, in 1992, they accessioned 8,700), APS allowed greater custodial control of the electronic records once they were in the archive.28 It too was buffeted by outside legal and administrative events, as its prototype testing period instead became an immediate deployment not for custodial and preservation management but for basic media migration—all in response to ongoing lawsuits over the preservation of presidential email. ¶ 58 Leave a comment on paragraph 58 0 Figure 14. Archival Preservation System Hash Validation Report. ¶ 59 Leave a comment on paragraph 59 0 In 2012, the file was then migrated into NARA’s Electronic Records Archive (ERA) system. The history of ERA merits its own essay, but broadly stated, the system integrates and extends some of the functions of APS and AERIC while also building an integrated environment for transfer, accessioning, preservation, and online accessibility to the electronic records in the system. TAGOKOR’s migration into ERA was accompanied by hash validation reports and other technical and custodial reporting and authentication. The evolution of analysis and preservation systems has allowed both greater understanding of the dataset’s content (and its weaknesses and inaccuracies) and enabled new methods of access and delivery to users. ¶ 63 Leave a comment on paragraph 63 0 Figure 15. “Sfc. Louis F. Walz (left), a member of Co. E, 5th Cavalry Regiment, 1st Cavalry Division, and Pfc. 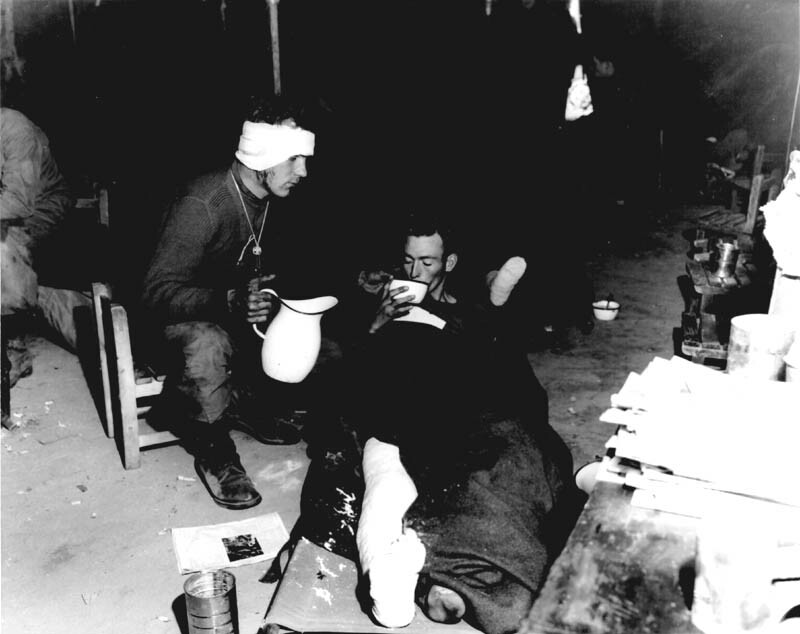 Raymond M. Szukla, a member of Co. G, 5th Regimental Combat Team, 24th Infantry Division, receive medical aid at the 8063rd Mobile Army Surgical Hospital, attached to I Corps in Korea. Sfc. Walz is recovering from a head wound, and Pfc. Szukla suffered a wound in the right leg while engaged in action against the Communist-led North Korean forces. 4 November 1950. Korea. Signal Corps Photo #8A/FEC-50-21377 (McIntosh).” Photo U.S. Army. ¶ 64 Leave a comment on paragraph 64 0 Digital preservation is often referred to as the process of ensuring access over time. Much as expectations of reference requests and use have influenced how TAGOKOR’s records were rearranged for public use, so have more contemporary legal contexts and communication systems driven how TAGOKOR is made available to researchers. ¶ 65 Leave a comment on paragraph 65 0 Figure 16. Desirable Output instructions. ¶ 67 Leave a comment on paragraph 67 0 Figure 17. 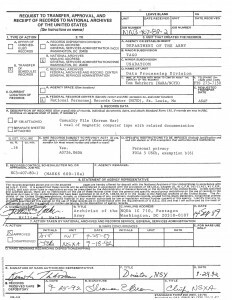 Crosstabulation report of the CASTYPE (Type of Casualty) field, character position 47-49. 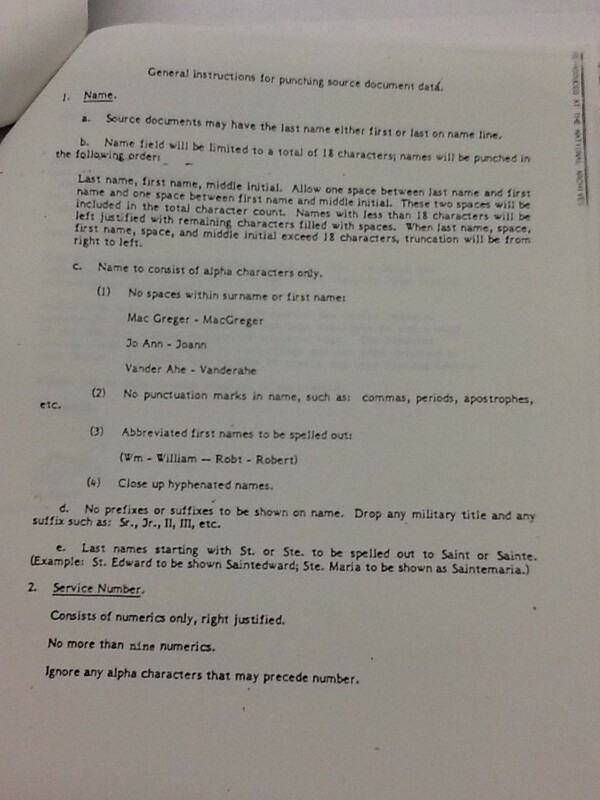 ¶ 68 Leave a comment on paragraph 68 0 Once accessioned by NARA, TAGOKOR was published in a variety of formats, including both print and digital versions. Researchers could use a number of print copies, some partially decoded, as well as supplementary research materials. 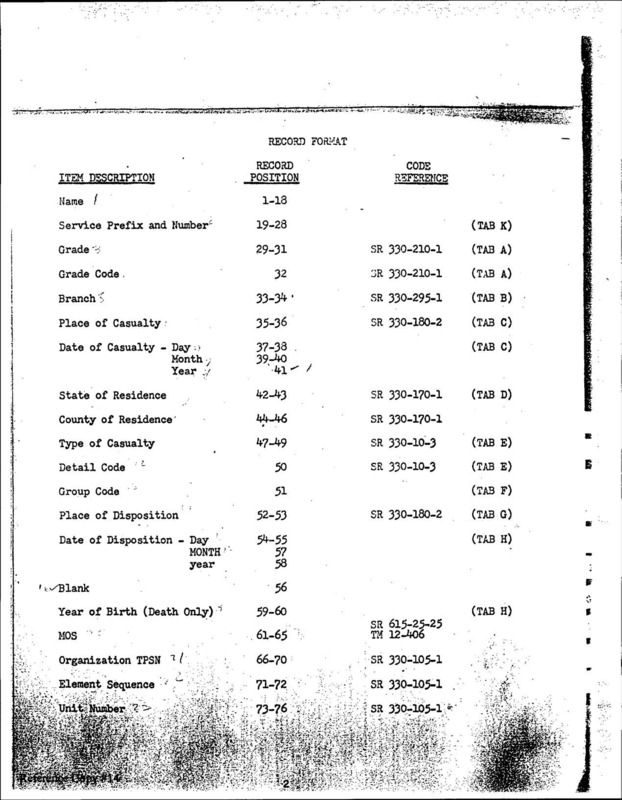 “Because of the heavy reference use afforded TAGOKOR, the Center has generated numerous supplementary reference materials including printouts, reference reports, SPSS Control Cards, and frequencies generated from the statistical analysis,” notes a document in the accession dossier.31 The frequency lists were intended to give a numeric overview of the quantitative information in the data set, the occurrence of the codes used in specific fields, and so forth. 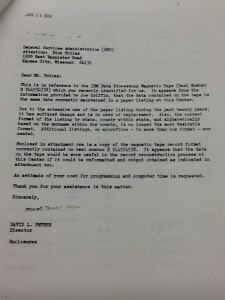 In addition, NARA originally offered a tape copy of the TAGOKOR file on both 9-track reel and 3480-class tape cartridge, encoded in either ASCII or EBCIDIC format. 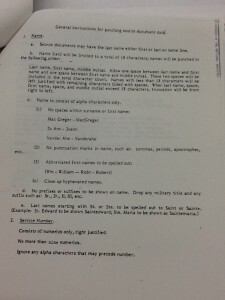 ¶ 69 Leave a comment on paragraph 69 0 However, the version of TAGOKOR that was being published in the early 1990s was not the entirety of the file. As a memo in the accession dossier notes, “Appropriate information in the records of nonfatal Army casualties has been masked in a public-use version of the data file. 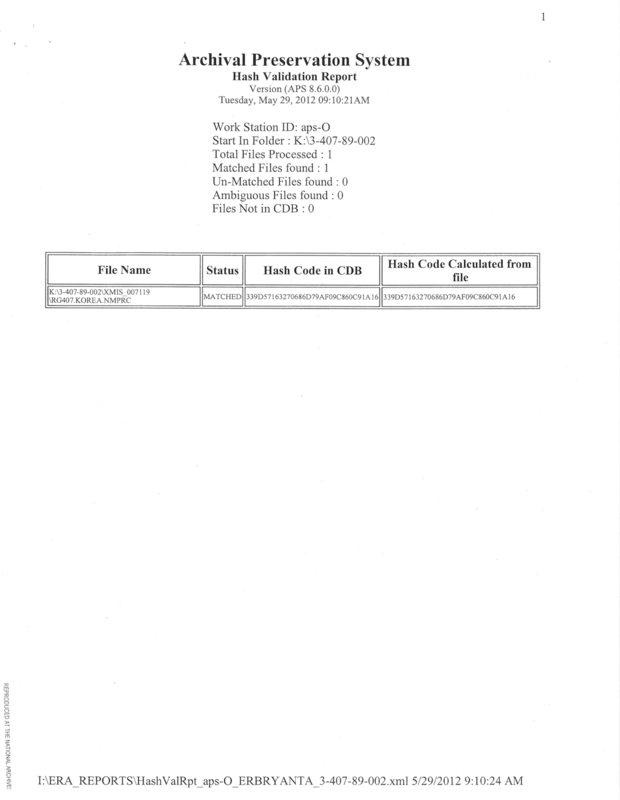 Each character of the name and service number have been replaced with a ‘#’ in all records not indicating death.”32 This action was premised on Freedom of Information Act (FOIA) statute b(6) that protects personal information, since many of the wounded veterans in the TAGOKOR file were still alive. ¶ 72 Leave a comment on paragraph 72 0 Research interest from Korean War veterans such as Joseph Hess drove availability of the full TAGOKOR file through FOIA requests, but the emergence of the World Wide Web created a means by which TAGOKOR’s records could be shared and republished for use outside of NARA. While NARA had long provided TAGOKOR in many formats, including electronic ones, TAGOKOR’s early appearance on the web reflects the characteristics of that medium—its quirks of design, methods of arrangement and access, and also its ephemerality. These websites provide their own parallel narrative of the retransmission and recontextualization of the TAGOKOR file. ¶ 74 Leave a comment on paragraph 74 0 Figure 18. Whitey Reese Korean Casualty page. ¶ 75 Leave a comment on paragraph 75 0 The above message, listed on the website of Whitey Reese in an October 10, 2004 capture of his website, available through the Internet Archive, marks the absence of the “Ramblings of Whitey Reese” website (original URL: http://www.theriver.com/Public/gcompany/), an early attempt to provide a list of TAGOKOR’s records via the web. 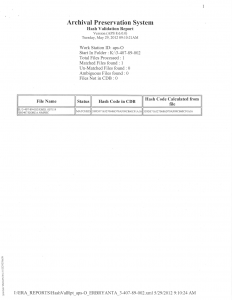 As the “General Notes” page describes, a “copy of this file [TAGOKOR] (along with code conversion documentation) was purchased from the National Archives and Records Administration by us (this web site) during the 3rd quarter of year 2000.” It also notes the incompleteness of the TAGOKOR file as well as the many errors and miscodings within its data. With an admirable spirit towards authenticity, the website explains, “This policy [of not correcting errors in the data] is implemented due to the fact that these listings have been extracted from an historical document and should accurately portray the natural existence of the document whether it contains informational errors or not.”36 Viewing the many captures of the website over time, a contemporary user cannot help but feel a nostalgic charm, no doubt evoked by the animated gifs, the blinking “click here” buttons, and the lengthy list of html tables—all reminders of early web design, syntax, and construction. That TAGOKOR’s reuse can be so historically situated, dependent upon the customs and visual aesthetics of early networked technologies, is a reminder of the file’s ongoing, alternate existence outside the custody of the National Archive. One can only ponder the number of early internet researchers who accessed this copy of the file over the version available in NARA’s reading rooms. ¶ 76 Leave a comment on paragraph 76 0 Figure 19. Borinqueneers Casualty page. ¶ 77 Leave a comment on paragraph 77 0 Of course the TAGOKOR file was used by other sites, such as the Borinqueneers Website, which commemorates the contributions of Puerto Rican troops to the Korean War, and the Korean War Project, a site that aggregates information from a variety of datasets to document the history of the conflict.37 Many of these sites combine TAGOKOR with related archival materials, such as those listing Marine or support personnel casualty information (TAGOKOR, as a reminder, only recorded U.S. Army casualties), or they mix and match TAGOKOR data with other files to highlight a specific unit, to verify service records and awards, or to substantiate years of service or dates of casualty. 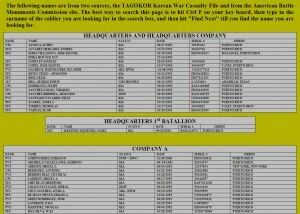 TAGOKOR has informed the casualty listings offline as well, providing troop listings for monuments and memorials, including those seeking to recognize veterans according to hometown or geographic area. ¶ 78 Leave a comment on paragraph 78 0 The Whitey Reese website makes it clear that the decoding and decipherability of the TAGOKOR file, however, has been the work of the user in the past. 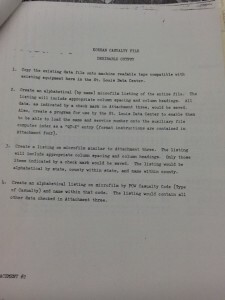 Public-use versions of the file have been arranged in ways that best enabled ease of search, and full copies of the file have been made available; but, access to individual records within the dataset required users either to request a full copy on media and decode it themselves or visit NARA. That changed in 2003, with the launch of the Access to Archive Database system (AAD), which allows users to search, query, and download portions of born-digital archival data files. The AAD currently provides access to almost 500 electronic files and databases containing around 85 million individual records. Figure 20. 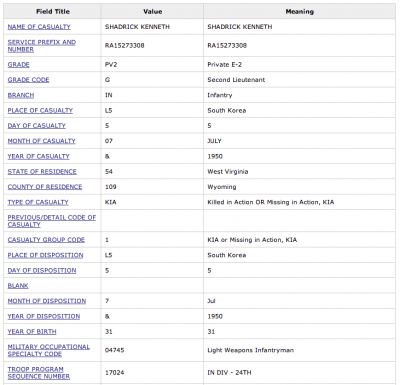 Kenneth Shadrick record as seen in the downloadable TAGOKOR ASCII file viewed in a text editor, on Whitey Reese’s website, on The Korean War Project website, and on NARA’s AAD system. Figure 20. Kenneth Shadrick record as seen in the downloadable TAGOKOR ASCII file viewed in a text editor. ¶ 80 Leave a comment on paragraph 80 0 The availability of the original data file allows for more contemporary reconstructions of TAGOKOR. These might employ a number of different new encoding and accessibility techniques. Contemporary data editing applications allow for user-driven deciphering, code frequency analysis, error identification and correction, and similar parsing and unraveling of the records. The availability of the full dataset also allows for the creation of data visualizations of the information and other novel methods by which to query and interpret the full extent of the 109,975 records in the file. While the database powering AAD allows for limited user querying, encoding the available TAGOKOR data into more semantic, machine-friendly formats would enable further expansion of the file’s accessibility and reuse, including making it machine-readable to web applications. This would allow the TAGOKOR file to be linked with other related datasets, collections, and primary source materials. ¶ 85 Leave a comment on paragraph 85 0 From EBCDIC to ASCII, from punch card to magnetic reel tape, and tape cartridge to spinning disk, as an electronic archival record, TAGOKOR has spanned a variety of media types and has been processed and reprocessed in a number of binary encodings. Each has left its trace upon how TAGOKOR, as a record, is inscribed, described, and preserved. Concomitant with this media evolution has been the variety of ways that TAGOKOR has been made accessible to, and interpreted by, researchers and the public, and how it has accrued the lineaments—technological and managerial—of its ongoing administration. TAGOKOR offers such a rich point of reflection on the nature of digital records because its origin as a statistical file seems to exist at such great conceptual distance not just from the tragedies, the literal mortalities, it tabulates, but because it exists as both calculation and abstraction. Its complicated administrative history, FOIA status, and preservation actions provide a distinct counterpoint to the brutal weight of the multitudinous human epochs it carries through time. ¶ 86 Leave a comment on paragraph 86 0 TAGOKOR also offers an illuminating example of a number of the unforeseen ways that records can come to be collected for the archive, the sometimes ad-hoc nature of early digital preservation efforts, and how networked technology has allowed for a method of public reuse and recreation seeded by, yet exterior to, the custodial institution. In fact, TAGOKOR’s story contains what can be seen as a unique pivot point between preservation and representation. At that moment when technical capability, technological infrastructure, and established best practices—as far as bit-level preservation—were understood and effectively administered by archivists, access issues began to morph. The changing legal context due to FOIA legislation and new access technologies allowed average users to provide their own methods of access to records and contextualize and describe them in personal, distinctive ways. As TAGOKOR the electronic record became better stabilized and validated, its representation became more unanchored, more refracted and restructured by users outside the archive and away from the paper printouts, key files, static interfaces, and legacy representations. ¶ 87 Leave a comment on paragraph 87 0 That act of publishing, of representation and dissemination, becomes the thread by which the biography of TAGOKOR is sewn, the loom upon which its legacy is woven. A photographer asks a soldier to coordinate his actions so it can be photographed for publication back home; a correspondent publishes reports on a dead soldier’s “unreal” expression; a clerk keys encoded information on a punched card; those punched cards are later published onto magnetic tape, to spinning disk, to reference room printout and data download. At the same time, the record is sifted, sorted, culled, and republished to the World Wide Web, then published again as visualizations, as relational database, with contemporaneous classifications and encodings. With each migration, the original record accrues the minor influences of media or interpretation, always a bit further withdrawn from its original referents as it is impressed upon by unforeseen uses and new methods of description and delivery. It accumulates, over time, its own parallel history of elision and elaboration—a history separate from the literal preservation of the bit sequence itself, but one that elucidates the regenerative nature of preserved records. ¶ 88 Leave a comment on paragraph 88 0 Similarly, historical contingency has played its own role in this narrative. Just as a combat photographer sought to record an image, and a war correspondent a story, elision and elaboration colored these events as well. For in fact, though widely hailed as the first American casualty of the Korean War due to the reporting of Marguerite Higgins and others, Kenneth Shadrick was actually not the first casualty of the conflict. 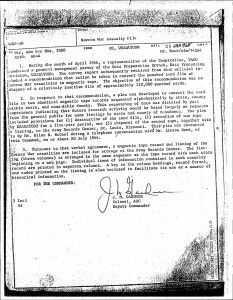 Indeed even the TAGOKOR file lists the first casualty date as June 30, 1950, in reference to the deaths of those aboard an American aircraft that was destroyed soon after landing. Shadrick was merely the first widely reported death, the first casualty to appear in the communication networks of the era—a reported fact that, in this case, is contested by the archival record itself. ¶ 89 Leave a comment on paragraph 89 0 “Whether captured in the blink of a shutter or accumulated over months and years of bookkeeping, inscriptions attest to the moments of their own inscription in the past. In this sense, they instantiate the history that produced them, and thus help to direct any retrospective sense of what history in general is.”40 TAGOKOR no doubt bears those legacies of its origin, but its biography resists categorization as a permanent static object. Attenuated through time materially, authenticated through time technologically, and compounded through time by annotation, dissemination, and republication, this digital record exists instead in an ongoing process of transformation, what Heather MacNeil has called “a continuous state of becoming … resituated in different environments and by different authorities.”41 Some social moments or technological processes have provided windows of stability in certain areas—hash validation can detect any bit-level change, raw data downloads can provide unmediated access—and flux and transition will not delineate all aspects of TAGOKOR or any other record group. But digital archival collections remain influenced by characteristics of media as much as by legal contexts of availability, as buffeted by administrative technologies of control and preservation as by social and cultural protocols and assumptions about reuse and circulation. 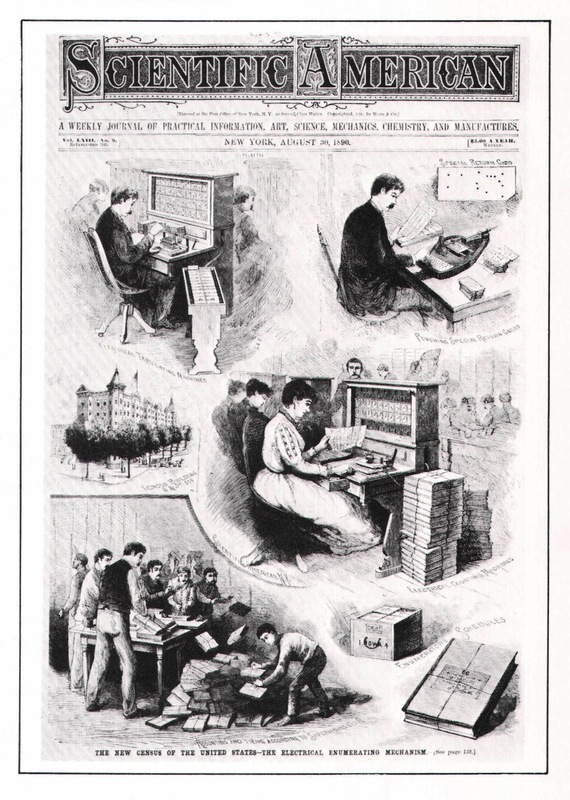 Once published and available, there exist multiple copies of TAGOKOR, a multiplicity of variants, some circulating in networks and social channels of dissemination, some migrated forward as preservation masters, some—such as the original punch cards—signified purely through their faint remnants in obsolete encodings or classifications. Each individual re-creation carries the traces of its former representation and bears the hallmarks of its current conventions of access. Each navigates the tension between the original event, that historical nexus of occurrence and inscription, and its contemporary explication and uses. And so the biography of TAGOKOR, like all archival records, is one both already written and never completed, both continually becoming and terminally changeless, forever poised between incident and encoding, articulation and preservation, record and reinterpretation, finality and vitality. ¶ 91 Leave a comment on paragraph 91 0 Thanks are given to the staff at NARA’s Center for Electronic Records who met to talk about TAGOKOR and CER’s history, and to the Manhattan Research Libraries Initiative (MaRLI) program that provides independent researchers special access to the collections of Columbia University, New York University, and New York Public libraries. ¶ 93 Leave a comment on paragraph 93 0 All data and documentation discussed in this article, including images of much of the on-site physical documentation and the FOIA-released accession dossier, are available at https://github.com/jeffersonbailey/tagokor/.